After you've added the tracking and confirmation code to your website, you should test your integration to make sure everything is working correctly. If you notice something isn't working quite right, please reach out to us at support@cartstack.com, and we'll be glad to help you troubleshoot. If you are located in the EU, your testing may not work unless you are using a VPN. See more info on the GDPR here. Ensure your site is in Test Mode. Navigate to your site and clear the cache. Add something to the cart on your site. Visit the checkout page and enter a valid email address. If your CartStack account is in test mode, be sure to enter the email address that is in the Test Emails field on your Settings page of your account. Move your cursor out of the email field. Abandon the checkout process by exiting the site or reloading the page. View the Send Queue report in the CartStack admin. If the tracking code has been installed correctly, you will see your email address listed in the Send Queue report. 7. Click the magnifying glass icon under "Actions" to view a preview of the email you're scheduled to receive. Open the cart reminder email you received after abandoning the checkout process. Follow the link in the email to complete your purchase. If the confirmation code has been installed correctly, you will not see your email address listed in the Send Queue anymore. Don't forget to cancel your order after your test purchase so that the charge does not go through on your credit card. Navigate to the Code page on your dashboard. Click the button on the right labeled Testing / Recent Activity. This will open a box that displays your Recent Emails Sent and Recent Purchases Recorded. If the website has been set-up for a period of time, both of these sections should be populated with your customer's emails. Recent Emails: Any CartStack email sent to a customer. 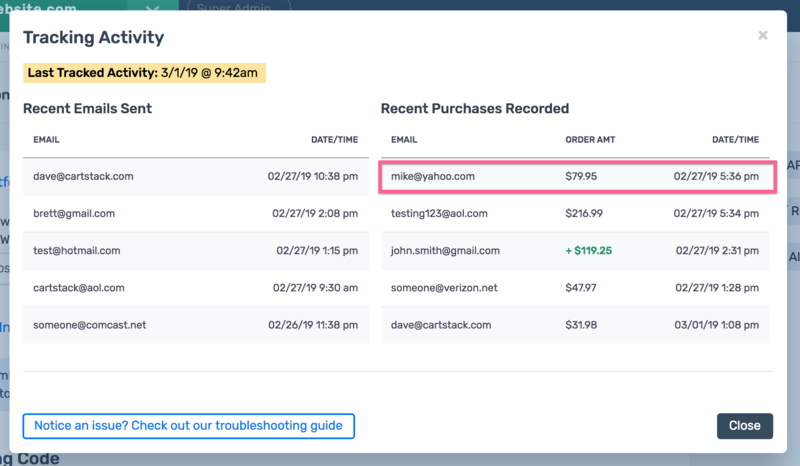 Recent Purchases Recorded: Any purchase made on your website regardless if it was obtained through a CartStack email or not.